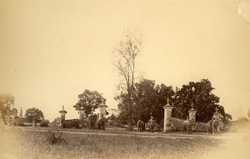 Photograph of the Ramna Gate to the Race Course, in Dhaka, now capital of Bangladesh taken in the 1870s by an unknown photographer. The view shows a number of elephants being ridden through the gate. The Race Course is now the Subrawardy Udyan, a park in the city and a popular place for recreation.